New statistics have been released from Raptr, who maintains more than 17 million users and tracks data across a wide range of games. Their latest data showcases an eventful decline in the player-base for 343 Industries' Halo 4, despite the release of timely DLC. 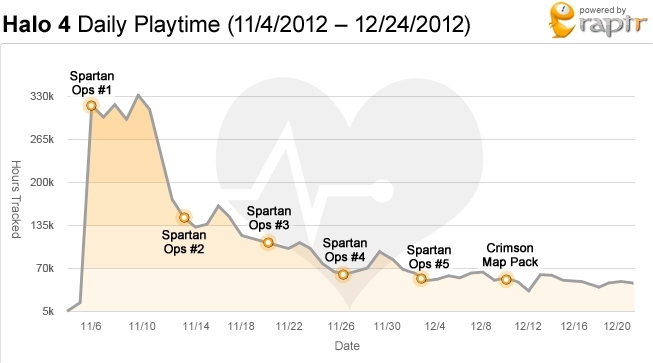 The Raptr report numbers are quite telling, first showcasing a timeline of how often gamers played Halo 4 and how often they played Halo: Reach. Halo 4 had a much higher entry rate of gamers playing the game, but by week 18 Halo: Reach managed to maintain a slightly higher edge in player retention. 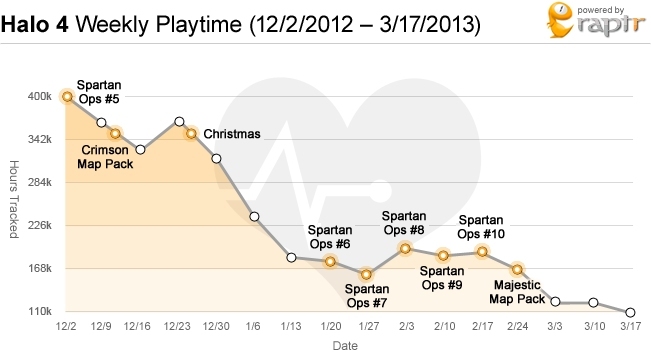 The real telling numbers comes with the stats of the periodical release of DLC in the form of Spartan Ops. As the numbers show below, shortly after the game launched the hours-played drop-off rate was astronomical, going from nearly 330,000 and dropping all the way down below 60,000 just a month later. Yikes. Weekly playtime also took a dive, first having a bit of a grand standing during the holiday season in December, 2012, but eventually the grandeur must have worn off because heading into the new year the weekly playtime dropped from beyond the 400,000 mark and by March, 2013, it was already below 110,000 hours played a week...even with new DLC being released in weekly intervals. So what are these numbers telling us? Given that Raptr's user base has grown significantly over the years -- so the pool of users tracked is much larger for recent games -- yet we're looking at a steep decline in play time for one of the biggest game launches in 2012. In a way, it kind of flies in the face of the argument that DLC is absolutely essential to keep a game popular or prevent it from being traded in. As the charted trend shows, Halo 4 declined in popularity over the months despite new DLC being made available on a weekly basis. Now, there's no definitive narrative to these numbers, as gamers could have bailed for a number of reasons. It's not unlikely that the DLC just wasn't very good or the game itself just didn't have enough staying power to appeal to gamers. I suppose the release of Call of Duty: Black Ops 2 on November 13th last year could show a real underpinning in the reason for the steep and sudden decline that occurred in the first chart, but from then on Halo 4 just never recovers. If Halo 4 really did lose to Blops 2 and the audience just never fully returned, it could point to the trend that Halo 4 was adopted first and foremost by casuals and only the dedicated group stuck around thereafter to support and play the game. Then again, any number of scenarios could be possible when regarding why gamers decide to drop a game and move on to another.